Inspired by the "city that never sleeps" the New York hairstyles collection by the BIBA Creative Team is a set of looks that are right at home in a high-energy environment and represent several aspects of New York City life. From the harried looks of the urban professional, to the sultry sway of the catwalk models, these women know what they want and exactly how to get it. These looks are the way to achieve those goals. The color palette for this collection is golden - golden blonde that is. The precise shades may range from golden beige to spun butter, but the hair colors work with the styles to emphasize the looks. This partial updo takes a long-layered cut and draws the left, back and crown sections into a knot at the nape of the neck. The top and right side are styled forward in a series of broad, crimped waves. The beige base color slowly pales into a golden blonde and the defined tendrils add light and texture to a veil of hair. The look combines what would otherwise appear diametrically opposite: formal up-styling and casual, wind-blown looks. It's a hairstyle that is full of visual interest. For the woman who wants an edgy, non-conformist look and who needs a hairstyle to counter overly-soft babyish features - with angles and edges - this short style fits the bill. The buttery-blonde hair is cut with a randomized, almost organic sense of balance. The haircut is haphazard, but only on the surface. The layers are meant to appear choppy and almost accidental, but they give texture and interest to a short hairstyle that takes it from a "typical" look to one that's guaranteed to make people take notice. Recreate the styling using a blow dryer with a sculpting paste and direct the hair forward slightly in the back and at the sides. This is the New York sophisticate - elegant, simple and pure. The color is golden and has a gentle variance adding highlighting tones. 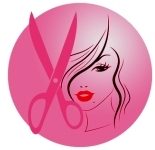 The haircut is a classic, A-line bob cut with forward swept ends that follow the jaw line. The fringe area spans from temple to temple and is cut in a clean-edged, horizontal line. The short hairstyle makes the most of the blunt, clean lines by enhancing the linear look and feel with smooth, sleek styling. Just blow-dry the hair with a flat brush and finish the lengths with a flat iron using a smoothing serum to add a glossy sheen. This long hairstyle represents the sultry side of New York City. The long layers are styled to maximize the volume and flow of the hair. The layers are razor-cut and styled to reinforce the structure and definition of the strands. They fall in large, sweeping curves and feather on a larger scale. The honeyed-blonde is mixed with neutral and warmer tones to add depth to the color and the strands offer additional shine and depth to the finished look.